I am extremely proud of our school and of our hard working and highly motivated staff and pupils. As an 'old girl' of St Paul's myself, I feel extremely privileged to lead the school that gave me such an inspirational, fulfilling and excellent education. I am, therefore, passionate in ensuring that all our pupils are likewise empowered and inspired by their educational experience. Foreign Language Spelling Bee Finalists! The teachers at St Paul's encourage us to work hard and strive to do our very best in school. Teachers support one another, sharing strategies and resources. Pupils are engaged in their learning and their behaviour is excellent. I am so happy that I chose St Paul's. It is such a privilege to go to such a wonderful school. St Paul's Sixth Form has helped me to build my confidence whilst having fun with friends in a happy, close atmosphere. Provision for Catholic life is extensive and is carefully evaluated. The hard work and dedication of all my teachers as well as their complete patience and understanding meant that I always felt I could approach them when I needed help. I love it here so much, I love the subjects, the food and the teachers! Pupils know that teachers have confidence in their ability to achieve because they have a rigorous and positive approach in lessons. My role takes commitment, dedication and at times perseverance, but gives me a fantastic feeling of satisfaction and enjoyment, whilst partaking in my responsibilities, and representing both our wonderful School, and Sixth Form. Great education, great teachers, great school. In 1908, what was happening then? The Queen Mother was a little girl of eight, growing up in a castle in Scotland. The country was at peace, with King Edward VII on the throne. Only very rich people had cars. To get around Birmingham you had to go in a horse-drawn omnibus. Many children still left school at the age of 12 and it was very rare for girls to go to university. 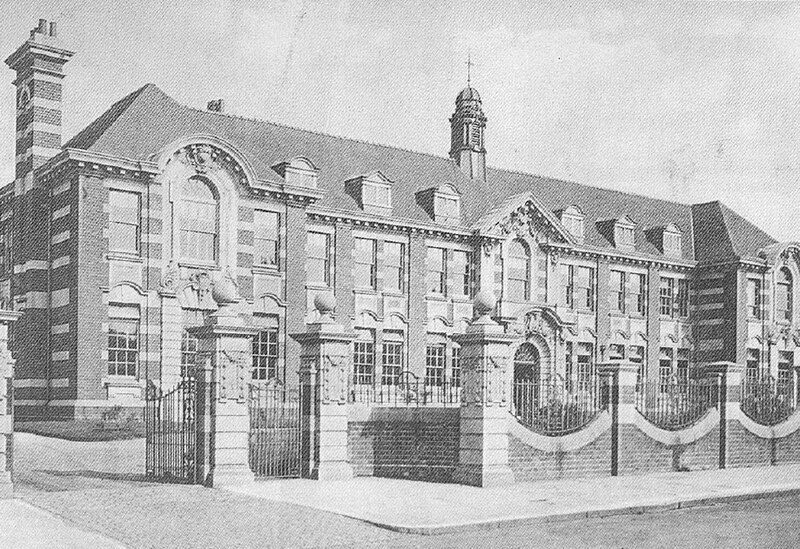 So, it was a really special day for girls on October 07 1908 when the brand new St Paul’s School was officially opened. Bishop Ilsley was there with various members of the clergy, sisters, local celebrities, and the Old Hall – the only hall then – was filled with plants and flowers. The opening ceremony included two musical items by the pupils, and the band of St Paul’s at Coleshill played. And so began the journey of St Paul’s through nine decades. Great success came in the first decade. Prizes were won. The school was inspected and was declared to be providing excellent education. There was fun, too. On special feast days Mother Emilia used to wrap and throw caramels from the balcony to the pupils in the Old Hall. The more agile the pupils, the more caramels they scooped up. Perhaps we might ask for this custom to be revived. 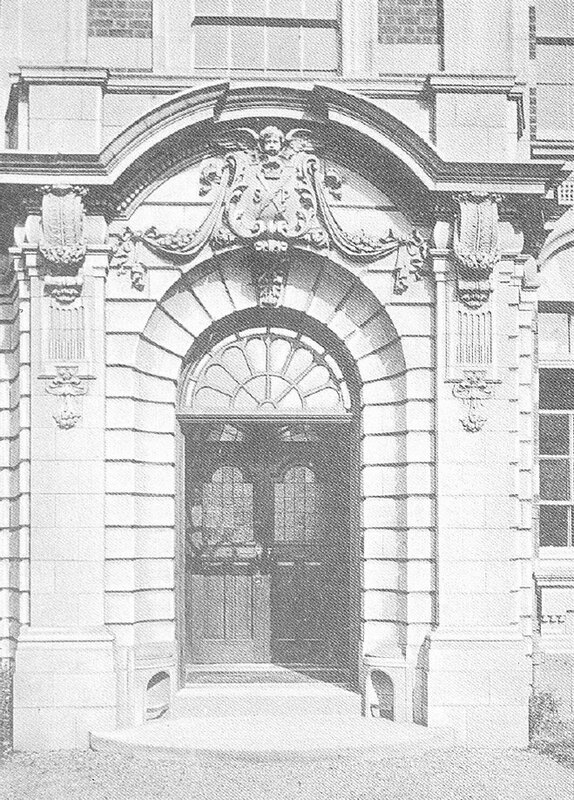 Six years after our grand opening, in 1914, war broke out between Britain and Germany and involved the whole of Europe. The men going to war sang such jolly songs as ‘Pack up your troubles’ to keep up their morale. 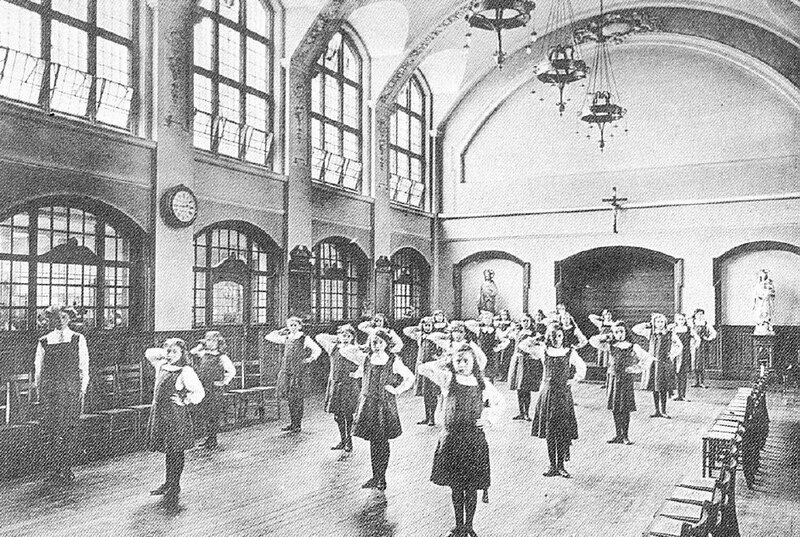 The pupils may have worn gymslips in the 1920s, but there was no gym. They had a lesson called ‘Drill’, which consisted of ‘Arms stretch, knees bend, etc’. They also had a long bench with a strip of wood along the top. They walked along this and jumped off at the end, remembering to bend their knees as they jumped. The Thirties! And by 1933 St Paul’s was celebrating its Silver Jubilee. The House system was well established, the four houses being Loreto, St Joan’s, St Agne’s and St Teresa’s. As well as sports, they competed for trophies like the Study Trophy, the Neatness Trophy and the Order Trophy. The school diary shows that House Meetings were held every month, and on the Feast Days of the various Houses there were parties, even fancy dress parties. At this time there were some boarders at the school. The Convent next door had not yet been built, and the Sisters and the boarders lived at No. 16 and No. 18 Vernon Road. It is recorded that the boarders had midnight feasts and that one of the priests from the Oratory came round and told them ghost stories. 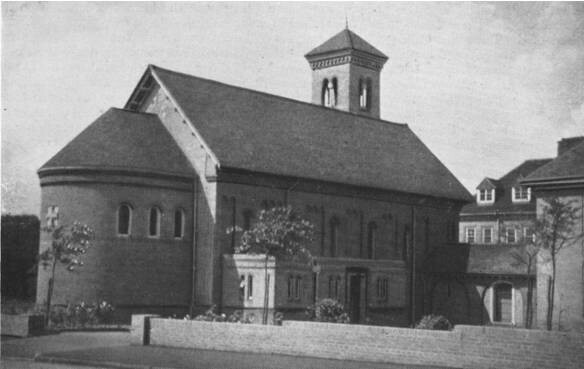 At the end of August 1939 we were called back to school where Sr Veronica, the headmistress, told us that those pupils whose parents wished, were to be evacuated within 24 hours to a secret destination, which turned out to be Hereford. We were issued with gas masks and instructions to carry them with us wherever we went. The welcoming Hereford householders took us into their homes and war was declared the following Sunday. However, battle did not commence immediately so after the winter we returned to Vernon Road to a school with reinforced walls on the corridors and adhesive paper darkening the window as a protection from shattering glass. Soon the Battle of Britain began in earnest with lessons being interrupted by the air raid warning signal – not always unwelcome to those who had not done their homework. “The real horror of war came home to me with the quiet sobbing of a friend in class who had heard that morning that her only brother had been killed in action.” said a pupil remembering those days. She recalls: After a few months of picking our way to school through a bomb scarred city we were evacuated to Shropshire and there we stayed till 1942 when the tide of war changed and it was safe to return. Back home a Girls’ Training Corps was formed and a handsome cadet officer gave us drill practice. We helped gather in the harvest near Coventry, and as Sixth Formers we were allowed to fire watch at school. 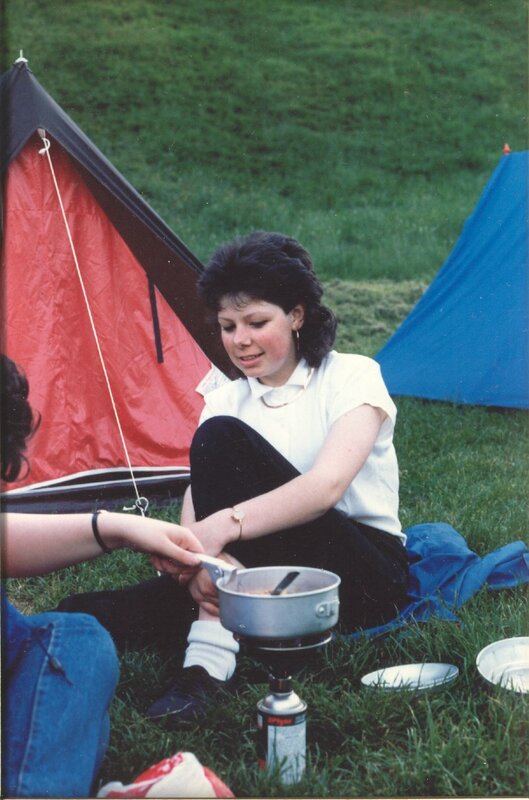 Many a night I spent asleep on a bunk bed in what is now Miss Allan’s office after having made the required patrol of the premises checking that no doodle bugs or fire bombs had been dropped on the building – a very responsible job which yielded 10 shillings, now 50p, a night in payment. The building was really much too small with no specialist Music or Art rooms. There was no changing room for PE. Also the playing field at that time sloped towards the reservoir – this had one advantage in that it made life difficult for visiting hockey teams unused to playing at an angle! In the 1950s all girls wore hats. Indeed the School Council got approval for straw boaters to be worn in the Summer for the Third Year upwards. These were considered very stylish, but were not very comfortable. They also gave the St Philip’s boys travelling to town by bus, great opportunities for tipping the hat over the wearer’s eyes! If the wearing of hats sounds very old-fashioned to us now, the school was moving with the times in other directions. The Hall, which in the 1950s meant the Old Hall, was used for lunch-time Rock ‘n’ Roll sessions. This apparently meant that many of the dancers were exhausted as afternoon school began! A year later one of the greater events in the school’s history took place – a visit from Mother Teresa of Calcutta, on 12 September 1974. All the girls were packed into the Old Hall, with the Sixth Form looking down from the windows on the top corridor. This is what one of Mother Teresa’s co-workers wrote: “We made our way to St. Paul’s Convent, Birmingham for lunch, followed by a visit to the attached Grammar School where Mother made a tremendous impact. One moment the hundreds of girls were chattering like magpies, the next moment, when they realised Mother was there you could have heard the proverbial pin drop. Then came the applause and the smiles. Flowers were presented, in fact Mother’s path seemed to be strewn with flowers that day, each gift being placed on an altar to the honour and glory of God.” She spoke to the girls in a gentle, quiet voice but every word could be heard and there was a sense of stillness in the Hall that had never been there before and never quite been achieved since. Two months later, on Remembrance Day, 11 November 1974, the school had its very own trumpeter to play the Last Post for a special Remembrance Day Assembly. Once again the windows on the top corridor were opened and the sound of the trumpet came down to the Hall below. The school entered the 1980s with Sr. Agnes, only the fourth headmistress in all the years of the school’s history watching over us. This piece of 80s music, Police with Sting ‘I’ll Be Watching You’ makes us think of her as she stood in the corridor doing just that. With Sr Agnes’ support and encouragement the Duke of Edinburgh’s Award became an important activity in the school. One past pupil remembers a day when she was chosen to take part in the Shropshire hills on a very chilly January day in order to have a TV interview with no less than Prince Edward. The details of this adventure make amusing reading, including the description of Prince Edward’s bodyguards who sported two-piece suits and lace-up shoes. But the highlight of the day was when the prince, ‘in true chivalrous style, offered to carry her rucksack’ – and she let him! 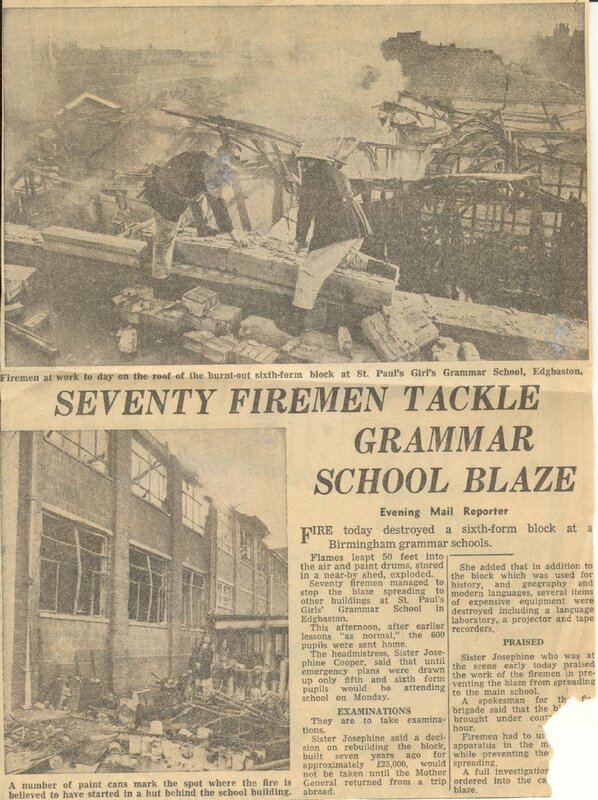 Not only was the school in the forefront of all the most up-to-date educational developments, its community was widening out considerably to reflect the rich diversity of the community in Birmingham. The Irish and English had always been well represented at St Paul’s, and Polish, Ukrainian and Italian families had joined them. 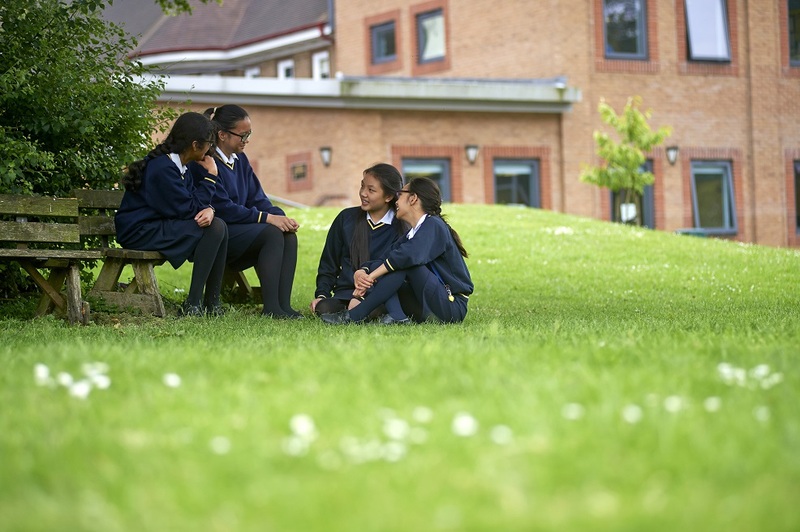 In the 1980s, St Paul’s received great enrichment from girls of the Afro-Caribbean, Vietnamese and Asian communities. In 1984 a Multi-cultural Mass was held, which celebrated this diverse cultural heritage. This is how it is remembered by one of our present teachers, then a pupil: “The practices were like a modern day version of the Tower of Babel, with everyone practising their parts of the Mass in their own languages – French, German, Russian, Polish, Vietnamese, Italian, Urdu, Spanish, etc. How God was going to make any sense of any of this was beyond me! Yet, there was a profound message, that, even though we had different cultures and languages, we all belonged to the one Father, the God of all nations and all peoples. On into the 90s and the school’s ninth decade. 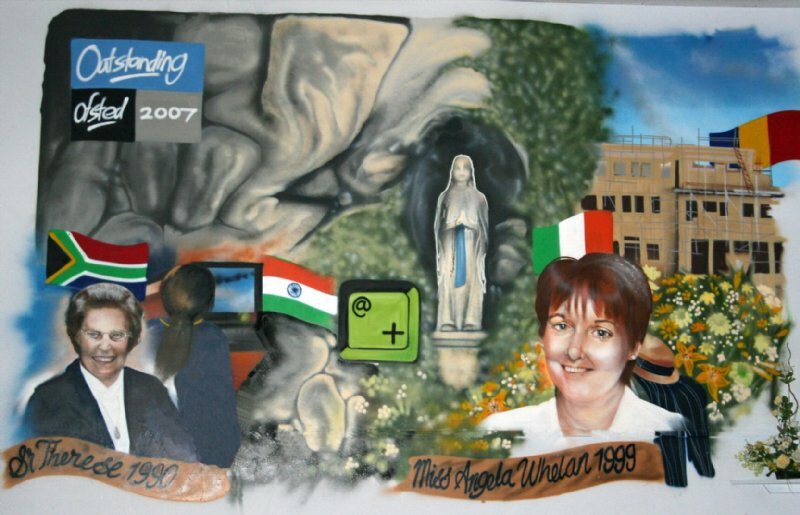 In 1990 we said ‘Goodbye’ to Sr Agnes – but she began a whole new connection for the school with Romania. A former pupil – another member of staff today – tells us how much the girls loved Sr Agnes, despite her sometimes formidable presence. Her memory is of the staff pantomime, which featured every fairy tale they could think of: “At the end of this pantomime, masked kidnappers appeared at each door of the New Hall and Sr Agnes was stolen away, only to be returned when the ransom demand had been paid. I remember everyone turning out their pockets and doing their bit to make sure Sr. Agnes was safely returned to us. Then we said ‘Hello’ to Sr Thérèse. As far as we know Sister has no connection with any firm of builders or architects but once she came, we certainly got used to a new style of hat around the school. We now have state-of-the-art Science Labs, Drama Rooms and Technology Rooms. We have a wonderful suite of Computer Rooms for Information Technology and Business Studies. I wonder what those girls of 1908, who watched the ladies and gentlemen arriving in their carriages that October morning would think of it all? Yet, in spite of the changes there is one thing we think they would recognise -–the spirit of St Paul that binds the community together. In December 1998, Sr Thérèse left St Paul’s to become the Generalate of St Paul’s community. Miss Mary Holland was Headteacher for one term until Miss Angela Whelan took the reins at Easter 1999. Together with all the staff we have seen the school gain specialist status, a new building, an accolade as an outstanding school and a wonderful celebration of its centenary in 2008. 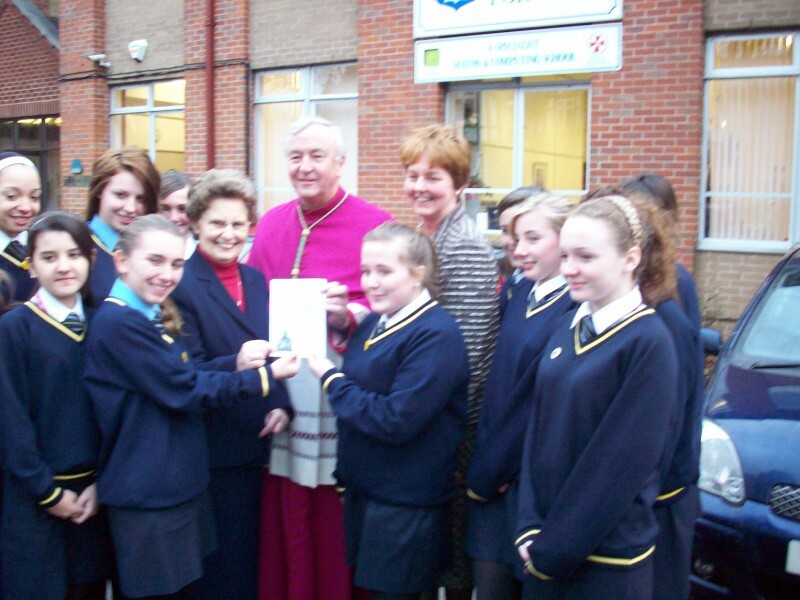 On 17 December 2007, the Archbishop also blessed a second foundation stone in readiness for the new building which the school has been eagerly anticipating for many years. This building will replace the 30 year old 'prefabs' which were erected as a result of a fire and also as a temporary solution to the expanding school population. 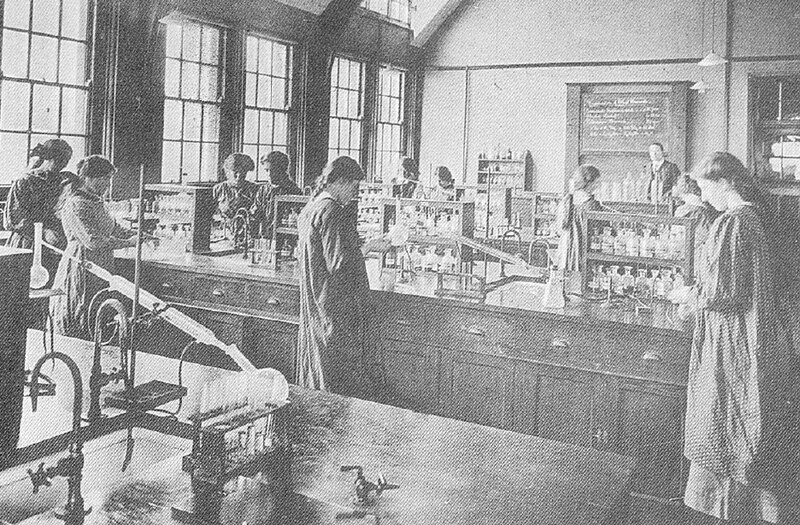 The popularity of the school was due to its continued success in preparing and educating young women to take their place in the world. A service of blessing took place in the school chapel to give thanks for all the opportunities that the pupils and staff have been given as members of the school community. It was also to express deep gratitude to the Sisters whose vision and dedication brought this school into existence and who continue to support it today, 100 years later. The service was celebrated in the presence of representatives from the Sisters of Charity of St Paul, including Sister Therese Browne, a previous Headteacher and now the Generate of the order. There were also governors, architects, builders, past and present members of staff, and pupils. The newly formed Centenary Choir gave an uplifting performance of Love Divine. After the service, the Archbishop met with members of the School Council and members of staff.